Last night I went to the Moth Club. I saw Parrots there a couple of weeks ago, it is near by, a nice atmosphere, cheap to get in (only a fiver!) and I like the gold ceiling there. 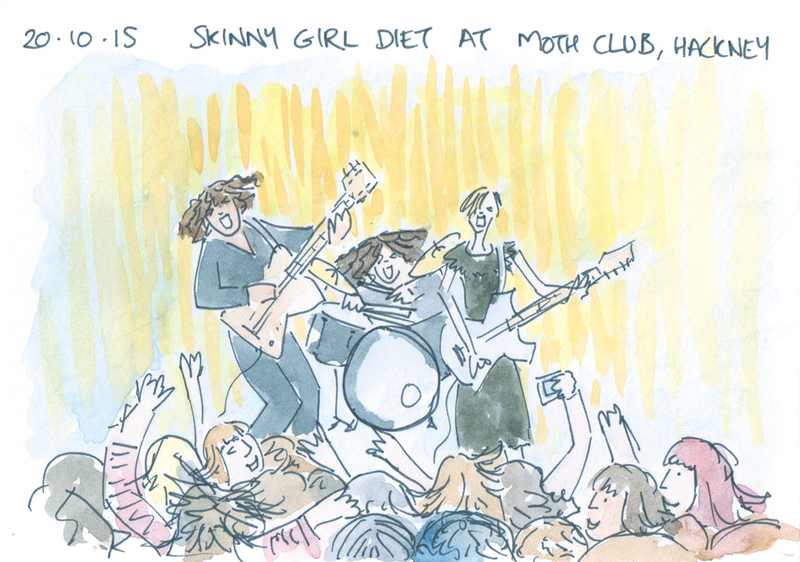 Last night Ghost Car and Skinny Girl Diet played, both new bands to me. The gig was sold out and packed. Around 70% of the audience was female. I haven’t been to a gig with so many women for ages (ever?). Both bands were fantastic. Gold Car have an organ player who adds an amazing sound to the band and Skinny Girl Diet remind me of early 90s grunge-punk. An energetic pit was formed on most of the dancefloor for the whole night. I bought records from both bands afterwards.